Even in export-oriented industries, only a handful of firms ship their goods abroad. These firms are systematically different from their purely domestic counterparts. This column sheds light on the domestic supply chain of exporters to uncover firms whose production is exported indirectly. Accounting for indirect exporters brings the empirics of international trade closer to the modern structure of production, characterised by many stages in possibly many locations. These findings suggest that the distributional effects of globalisation go beyond the exporters versus non-exporters dichotomy. The capability of domestic firms to compete in foreign markets is an important indicator of a country’s economic strength and a target of many economic policies. It is an established fact that even in export-oriented industries, only a handful of firms ship their goods abroad and that these firms are systematically different from others (Bernard et al. 2012, Wagner 2012). Recent research, however, highlights that many firms may export indirectly either by using trade intermediaries or by having their products used in other firms’ exports as intermediate inputs. Empirical evidence from a range of countries shows that wholesalers and retailers account for 10 to 20% of exports value and that even manufacturing firms act as trade intermediaries (Abel-Koch 2013, Di Nino 2015). Furthermore, a recent effort to quantify international trade in terms of value added emphasises that in the age of production fragmentation and global value chains, gross trade flows do not give us an accurate picture of the origins of the value embodied in traded goods (Koopman et al. 2014). Therefore, they convey very limited information about where the jobs and profits associated with the production of traded goods lie. For instance, services, which are considered rather non-tradable, make up an important share of international trade when we take into account their value added embodied in traded goods. In the same manner, the sole focus on firms that are recorded in customs data disregards the vast firm network that underpins export production, and therefore conceals many of the interconnections between domestic firms and international markets. To understand an economy’s involvement in international trade and the characteristics of firms that produce for foreign markets, we need to look beyond the firms that own a good when it crosses the border and recognise that many firms engage in international trade indirectly. In a recent study, my co-author and I use a new and unique Belgian database on domestic trade to unveil the supplier network of exporting firms and its characteristics (Dhyne and Rubínová 2016). By encompassing all firms that contribute value added to exports, we offer the first complete picture of firms that produce for foreign markets. Belgium is a small and very open economy. In 2011, 33% of the value added in Belgium was ultimately consumed abroad (OECD, TiVA). Yet only around 7% of all Belgian firms export goods. The role of wholesalers in export activities is large – they make up 36% of exporting firms and almost 20% of exports. Furthermore, calculations based on international input-output tables suggest that more than 40% of the domestic value added embodied in exports is indirect. Our domestic trade data, which are based on value-added tax reports, include transactions among all Belgian firms in the non-financial business economy and therefore can be used to identify firms that participate in exports production indirectly. As a first step, we split firms that do not export into those that only buy from other business and those that also sell to other business because only the latter have a potential to be connected to an exporter. 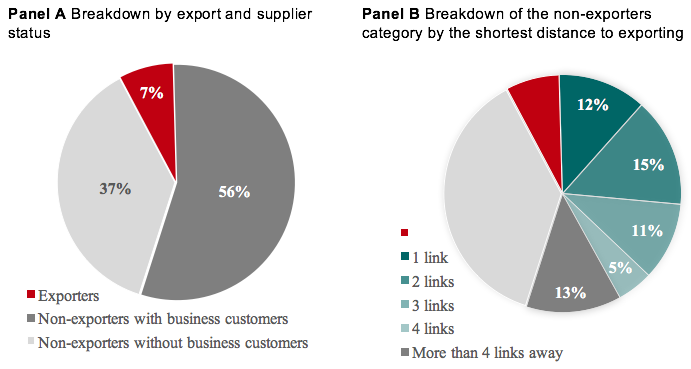 Panel A of Figure 1 shows that 56% of firms do not export directly and have a business customer. As a second step, we categorise these non-exporters according to the smallest number of transactions that connect them to a foreign market. A direct supplier of an exporter is one link away from exporting, a supplier of a supplier of an exporter is two links away, and so on. Panel B of Figure 1 illustrates the distribution of firms when we unbundle the non-exporters category. The figure reveals that firms who are involved in exports production permeate the economy. While only 7% of Belgian firms sell goods on foreign markets, another 12% are direct suppliers of these firms, and an additional third are between two and four transactions away from foreign demand. It is an established fact that exporting firms are larger and more profitable and in many other respects perform better than their purely domestic counterparts. In our paper, we show that this fact also holds for non-exporting firms whose goods or services are exported indirectly. Firms up to two transactions away from foreign demand perform significantly better than the rest of the economy according to various measures such as value added per worker, total factor productivity, sales, or the number of business customers. Furthermore, there is a hierarchy within the export supply chain whereby the performance measures decline with the distance from foreign demand. Figure 2 illustrates the hierarchy by plotting the average size differences between firms up to two links away from exporting and the baseline category (firms more than four links away from exporting in the same industry). 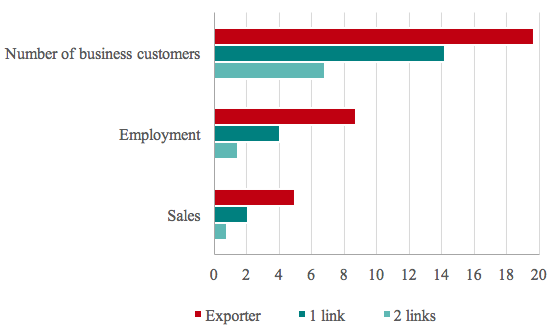 For instance, exporters are almost nine times larger in terms of employment while firms one link away from exporting are four times larger, and firms two links away are one and half times larger. 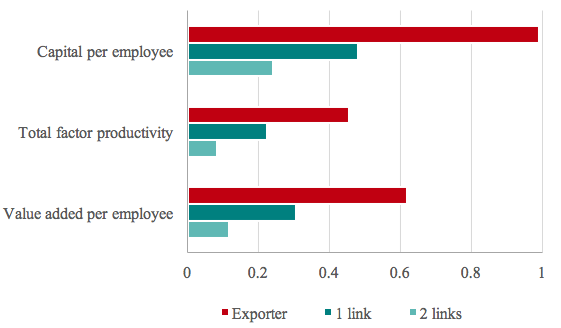 Figure 3 shows differences in productivity and capital per employee conditional not only on industry but also on the number of employees and business customers. Compared to the baseline category, the total factor productivity of the three groups is 45%, 22% and 8% higher, respectively. Note: The chart shows how much each group differs from the baseline category (firms more than four links away from exporting). The differences are computed within industries. For each outcome, the differences are statistically significantly different from zero and from each other at the 95% confidence level. Note: The chart shows how much each group differs from the baseline category (firms more than four links away from exporting). The differences are computed within industries and conditional on the number of customers and employees. For each outcome, the differences are statistically significantly different from zero and from each other at the 95% confidence level. The observed export supply chain premia are supported by complementary evidence. First, firm performance is increasing in the number of exporting customers. We control for the total amount of business customers and therefore show that the relationship goes beyond the fact that more productive firms have more customers in general. Second, the extent of foreign demand exposure, measured by a proxy for the share of output embodied in exports, is also positively correlated with firm performance. For direct exporters it is only the direct exposure that matters while for firms without a direct exposure the indirect one plays a role. Furthermore, the correlation is stronger with the direct than the indirect exposure. These results thus corroborate the exports supply chain hierarchy. A better understanding of the production structure that underpins observed international trade flows is important for assessing trade-related policies. In complex economies that are characterised by a large degree of production fragmentation, customs data alone provide limited information for answering questions such as which firms are impacted by trade policies, or how foreign demand shocks can propagate throughout the domestic economy. The established fact that exporters are a small club of the best performing firms gained them the label of ‘export superstars’. These firms, however, are just a tip of the production iceberg as they are embedded in domestic networks of firms that are exceptional performers themselves. Thus even though direct exporters shine the brightest, they are in fact part of bright constellations. These findings emphasise that the group of stakeholders in trade liberalisation negotiations is much wider than the ‘happy few’ who export directly and that distributional effects of globalisation go beyond the exporters versus non-exporters dichotomy. Abel‐Koch, J (2013) “Who uses intermediaries in international trade? Evidence from firm‐level survey data”, The World Economy, 36(8): 1041-1064. Bernard, A, B Jensen, S Redding and P Schott (2012) “The empirics of firm heterogeneity and international trade”, Annual Review of Economics, 4: 283-313. Dhyne, E and S Rubínová (2016) “The supplier network of exporters: Connecting the dots”, Working Paper No 296, The National Bank of Belgium. Di Nino, V (2015) “The phenomenal CAT: Firms clawing the goods of others”, Questioni di Economia e Finanza, Bank of Italy Occasional Papers. Koopman, R, Z Wang and S-J Wei (2014) “Tracing value-added and double counting in gross exports”, American Economic Review, 104(2): 459-494. Wagner, J (2012) "International trade and firm performance: A survey of empirical studies since 2006", Review of World Economics, 148(2): 235-267.